A large number of bodies are found at the lake in Inokashira Park. With the arrival of the big news, Yuta diligently updates Kiri Kiri Basara. Professor Hashigami was murdered, and the cause of his death is unknown. However, there is a dying message left by Hashigami at the crime scene. A high school student who stumbles on a murder scene spirals into paranoid delusions as he becomes convinced the police are after him. 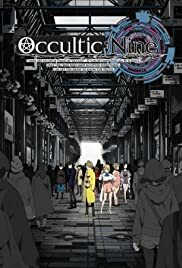 This "paranormal science" story follows nine idiosyncratic individuals, linked by the "Choujou Kagaku Kirikiri Basara" occult summary blog run by 17-year-old second-year high school student Yuuta Gamon. Little incongruities that occur around these nine eventually lead to a larger, unimaginable event that may alter what is considered common sense in this world. While the show becomes increasingly hard to keep up with, it's worth a watch. I am writing this review as one who does not know what the term "NEET God" means. The show focuses on this nerdy kid and eight other relevant characters. Visually, this show can be vertigo inducing at times, where it feels like the directors are switching things up just for originalities's sake. I found that these rapid rotations/inversions/ and what may be seen as silliness served the purpose of keeping the tempo of the show proper. The story is so vastly interesting that it likely would have been equally interesting in a longer series. In 12 short episodes though, the urgency of the direction and advancement of the plot was breathtaking. I can't say much more than that, just stick with the series and see where you end up, if you are more than halfway through, see it through to the end. I hope to see more from this team in the future and highly recommend this series.